If you thought sushi was all about raw fish, then you’re clearly living in the eighties. In the twenty first century it’s all about the plants, so although I’ve used peppers and avocado here, you can fill your sushi with anything you fancy really. Asparagus is great, as is carrot or anything else you can cut into long strips. Marinated tofu works really well, and if you can’t be bothered marinating your own, Cauldron make a fab pre-packed version. All my sushi stuff is from the Yutaka range, because it’s readily available in supermarkets and is easy to divide up into portions. Experiment with fillings and combinations and you’ll soon have your own go-to sushi recipe. First of all, roast your peppers. To do this, slice up a couple of peppers into four (getting rid of the seeds and stalk) grab a roasting tin (or baking try, whatever you have) pop a bit of water in it (enough to just cover the bottom) and place the pieces shiny side up onto it. Now, some people use oil, but I figure, water is free and if you wet the tops of the pepper pieces it stops them from drying out. It basically does the same job, minus the fat. Stick them into a pre heated oven (150 degrees/Gas mark 3) for around 30 mins. While the peppers are roasting, measure out the rice. You’ll need to wash it, so what I normally do is just put it in a sieve and run it under the cold tap till the water goes from cloudy to clear. Give it a good swoosh around to make sure. Put the rice in a pan that has 330ml of water in it and bring to the boil. It’ll bubble and froth a bit when it’s boiling, but don’t take the lid off, just turn the heat down and let it cook for ten minutes. Once ten minutes has gone by, turn off the heat and let it sit for half an hour WITH THE LID ON. 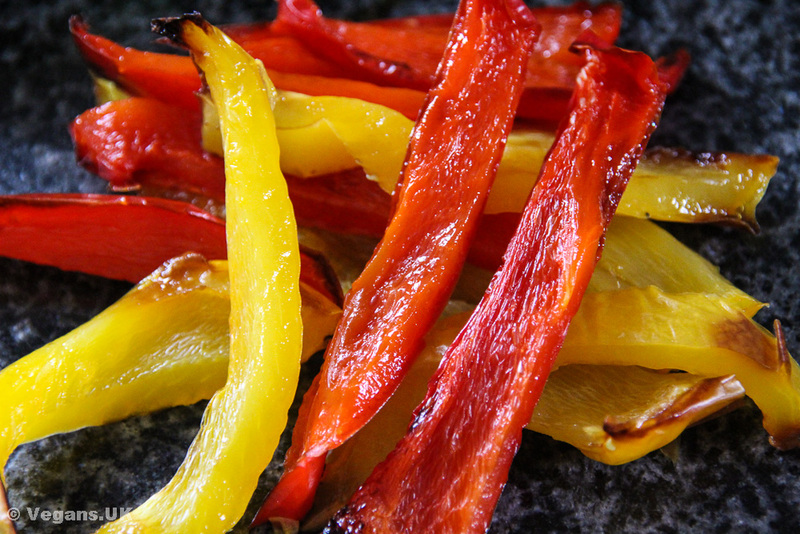 Once your peppers are roasted (they’ll be browning slightly) take them out of the oven and let them cool. When your rice is ready, take the lid off and let it cool too. 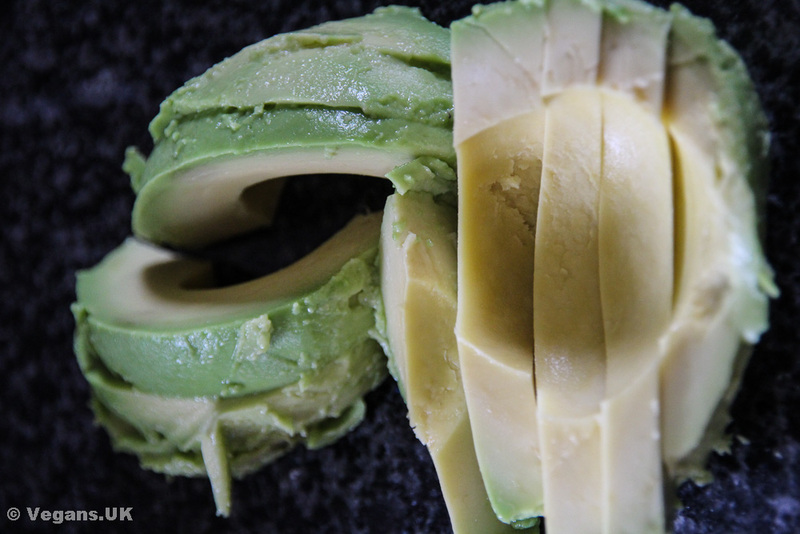 Prep your peppers and avocado by slicing them up into long thin strips, as shown. Once the rice has cooled a bit, I normally divide it into five sections using a wooden spoon, just so I know I’m going to put equal amount of rice onto each nori. Now, there is a diagram on the back of the nori packet on how to roll the sushi. I generally just take up the nori and the mat in my hands and, with my fingers, squash the filling in as I roll so the rice surrounds it. At the edge, I moisten the remaining nori with water, and sort of ‘glue’ the two layers together. Seriously, just follow the diagram or just roll it any way that works for you – it won’t impair the flavour! Repeat this process until you have five long rolls. If you like you can put them in the fridge for a while to make them more solid and easier to work with, but if you’re starving then line them up and with a sharp knife (I find a bread knife works best) slice them into eight. The ends won’t look too pretty, but unless you’re serving a dinner party, this doesn’t matter much. The middle sections should be scrummy little morsels of yummy-ness. Serve arranged on a plate with soy sauce for dipping and some ginger to refresh the palate. This recipe makes 40 pieces, which should serve two to four people, depending on how hungry you are!